and return to your original self while enjoying the subtle aroma of sandalwood throughout the resort. This is the gentle and luxurious space we have created for our guests. Sandalwood is a fragrant tree which has captivated people around the world since ancient times with its elegant aroma. increasing immunity, antibacterial purification, and relieving bodily pains. Our desire is to maintain the spirit of the benefits of sandalwood while providing sincere hospitality creating a resort where you can relax almost hearing the aroma of the sandalwood. The concept of our rooms is to provide our guests with a space surrounded by nature based around tasteful Japanese furnishings. the chirping of the insects, and the light and shadows cast by the various deciduous trees. We provide private hot spring water blessed with good source quality to all the open-air baths in our rooms. 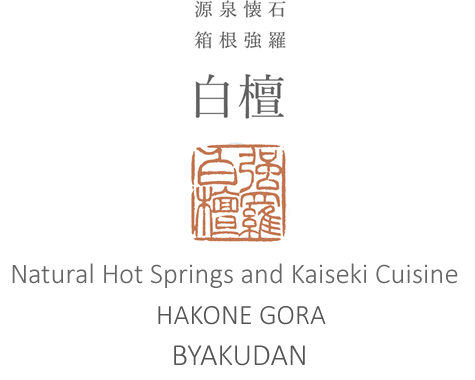 we select seasonal ingredients from all around Japan, the blessings of nature. along with a selection of Japanese sake and wine to complement the Japanese cuisine. We also offer special rice Japanese ole styled cooked in earthenware pots for breakfast. Byakudan's recommended sake and wine will complement your Japanese meals. Please enjoy them to your heart's content along with our selections of Japanese sake and wine. We will provide the ultimate companions to complement your cuisine. causing Gora to develop into a luxury health resort of holiday villas. with the development of Japan in the late Meiji era. The private source waters of Byakudan are prominent among these which are golden in color. The Gora hot spring is mildly alkaline sodium chloride, known for making one’s skin smooth. contusion, sprains, sensitivity to cold, chronic women's ailments, chronic digestive ailments, and more. we can provide the freshest natural hot spring water without any circulation process. in our large public baths luxuriously decorated with rare natural stones, Izu stones.